Our chef Matt, went on a little adventure last week, and it ended in some delicious results! Past the yellow slime mould and the cramp balls I make my way to the stream at the bottom of the wooded valley. The most poisonous plant in the northern hemisphere Hemlock Water Dropwort clings to the banks, this is a good sign, an indication I'm in the right habitat for my quarry. I'm going to get muddy, very muddy buts it's going to be worth it as I'm on the quiet hunt for Scarlet Elf Cup fungi. This stunning edible fungi loves damp ground, wooded valleys preferably with a stream and lots of moss covered dead tree branches from which it erupts with it's vivid red flesh. Normally fungi of this colour would scream at you “don't eat me!” Not so with these little gems which are perfectly good eating, a mild mushroom flavour and sometimes a slight woodiness with a firmer texture compared to other edible fungi. 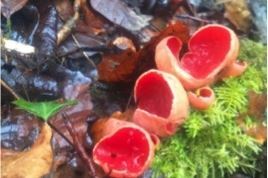 The saying goes 'you eat with your eyes' and this is very true of the Scarlet Elf Cup. They can be gently pan fried in a little oil and butter or used in a stew. Although I do find over cooking they tend to lose their flavour. For any slow cooked dish stir them in just before serving. I love these raw, as with any wild food take a nibble first to make sure you don't have any adverse reaction. 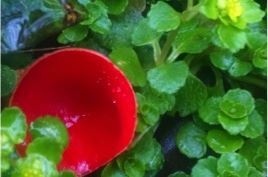 When it comes to flavour pairing I would choose ingredients that won't overpower the subtle scarlet elf cup and at the same time contrasts its bright red colour. Normally I love to cook rustic hearty dishes, but it would be a shame to lose the vibrant colour in a stew or under sauce. 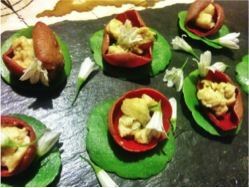 To do these beauties justice I came up with this simple but stunning canapé recipe. Combine the egg, cream, leek, salt and ras-el-hanout and lightly whisk. Scramble the egg mixture as normal in a little butter to desired texture. Meanwhile fry the elf cups in a little oil and butter for no more than a minute, overcooked they will to lose their delicate flavour. Place each elf cup on a pennywort leaf, fill with the scrambled egg, and garnish with wild leek flowers. Serve.